I was born in Brook Road Brentford, 1944, and lived in Brentford at various addresses until I was about 22, including James Bradbury's at 108 High Street. My father, Cyril Henry SHARP worked at Kingham's from as far back as I can remember. I believe he may have started working there just after the war, after he left the Fire Service. Joseph Kingham was born in Bierton Buckinghamshire about 1823. At the 1851 census he is living with his uncle on a farm in Whitchurch Bucks. By the 1861 census he is married to Mary and they have a Provision Merchants at 47 Market Square Aylesbury. By 1871 the shop was now at 33 Market Square. Joseph and Mary had about 10 children and three of his sons; Joseph born 1857, Thomas born 1860 and Herbert born 1870, arrived in Brentford sometime before 1881, where they opened a Provision Merchants at 86 High Street Brentford. The brothers shared the premises with one of their sisters Julia, and a servant Lydia SWINECLASS. Joseph Kingham, born 1857 was living at 171 Boston Road Brentford at the 1891 census and married to Charlotte. They had one son Roy V. and a servant Kate L TRUMPER. By 1901 they had moved to Pinehurst, Ashburnham Road, Hastings, and had a daughter Constance E. Kingham born 1897. They also had a governess, Ethal A TARRELL, and two servants Amy WARREN and Emma E RIDGEWAY. The property also had a cottage in the grounds which housed the groom & gardener; Mr Joseph SHORTER and his wife Sarah. Thomas C Kingham born 1860 was living at Waverley, Boston Road, Brentford, in the 1891 census. Unmarried but with a servant Ellen HILLYER. By 1901 he had married Henrietta and they lived at Rafael House, Wellington Road, Hounslow. They had one son Robert L born 1900 and employed a governess, Julia BARTLETT, and two servants, Susan HARVY and Harry CLARKE. After having traded in Brentford High Street since the 1800’s, Joseph Kingham & Sons Ltd moved to larger premises at 40 Kew Bridge Road, Brentford around 1913/1914, according to telephone directory records. 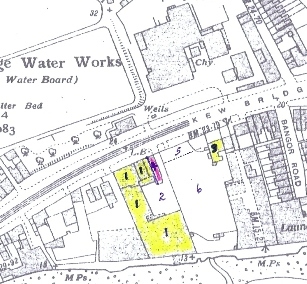 The map from 1935 shows the River Thames bordering the south side of Kingham's premises and the Water Works opposite. The new warehouse and yard occupied a site on the south side of Kew Bridge Road. The telephone number was Ealing 66. By 1920, they had added a second number; Ealing 51. Later a 10 x 50 PBX GPO switchboard was installed, and their number became Ealing 3181 later changing to Isleworth 3181. The premises consisted of a warehouse, offices, yard and gatehouse, also known as “The Lodge.” To the east of the property, Kingham’s also owned or rented the adjoining block of land which consisted of a large house, referred to as “The House,” with a car park and garden which extended to the River Thames. A large two storey semi detached residence stood on the eastern boundary of Kew Bridge Road. It was far larger than the one it was adjoined to. The main front door faced west and had a large porch. The entrance hall was room-sized and had a long staircase spanning the far (east) wall. To the right were two very large reception rooms which were opened every year around September to house the displays of Christmas lines, hampers, etc, and customers would come along to view them and place orders. To the left of the front door was a large wood panelled dining room which was used as Kingham’s staff canteen until about the early 1950’s. The kitchen and scullery were beyond another front door that opened onto Kew Bridge Road. I assume this would have been the tradesmen’s entrance when it had been a private residence. Upstairs, there were six large bedrooms plus a bathroom and separate toilet. Three of the rooms were used as offices. One was the Sales Ledger Office, where I worked from 1959. Next door was the accountant, Mr FILMER's office. Then Mr BOWES, the transport manager’s office. The other three rooms were used for storage. One housed the old accounts which, judging by the huge piles had probably been kept since the place opened. The adjoining land had a high brick wall fronting Kew Bridge Road, with a pair of large wooden gates. The front part was used as a car park for the few who owned cars and drove them to work. Employees were given permission to park there and a place was allocated, and woe betide anyone who parked in the wrong place! There was one large garage opposite the gates which was for the use of the managing director’s car. Kingham’s had one company car, a black Morris Minor circa early 1950’s. reg no: OYX 350. I remember this number because the car was often referred to as “O.Y.X.”. This was used for trips to the bank for the wages each week and other errands. Behind the car park was a large garden area which extended down to the Thames. A huge tree grew in the grounds and its boughs were held together with large chains. Several other trees and mature shrubs also grew there including a Bamboo plant which I thought was very exotic. There was also a round brick building with a brick domed roof approx 2 metres across, at the back of the garden, and it had a door which was chained up. Some of the brickwork had caved in and I would climb up and look inside. It appeared to be some sort of well, which was always full of water and had some iron object projecting out of it. I was told to keep away from it in case further brickwork gave way and I fell in. I could never find out what its purpose was, but I was informed that the house and garden was once the residence of the manager of the Water Works, which was opposite, and the round domed building was something to do with the water works. I was told the garden was allocated to staff for use as allotments at one time, which I assume was during and between WW1 and WW2. When we lived there no one had used it for some years, and it was very overgrown. My parents took it over and laid a new lawn and flower beds, and we also grew vegetables. I was informed that the building was designed by a Dutch engineer and the foundations were rafted as it was built close to the waters edge. I recall the back of the warehouse only flooding on rare occasions, during extremely high tides. The main building housed most of the offices and the warehouse. The offices were on the first floor above the loading bank and main entrance and had windows fronting the yard. The Managing Director’s suite was the bay window to the left of the building and had its own toilet and wash basin facilities. The Managing Director was Mr HEATHER, (Or ETHER) in the early 1950’s. When he retired Mr ABBATT took over, and remained until the place closed. His secretary was Miss WOODS. Looking right from that window was the Sales office, Pay office, Bought ledger office and Typing Pool on the far right. Charlie HODKINSON was the mechanic in the late 1950’s, and he was kept in constant work servicing and repairing the fleet of Bedford 3 tonne vans. Some were ex Army war time vehicles and the only starter was a handle. Kingham’s had its own petrol pump in the yard, which was hand operated. By turning the handle the gallons registered on a small front dial. It was kept locked, and drivers had to collect the key and fill their own vans and a record was kept of the gallons used. There were at least a dozen vans all with drivers and van boys when I lived there in the late 1950’s. Kingham’s delivery area covered a good 50 mile radius of Brentford. One of the larger customers was The Ford Motor Company at Dagenham, Essex which had a large order for each of its canteens every week. See below for more details of the 1921 photos. 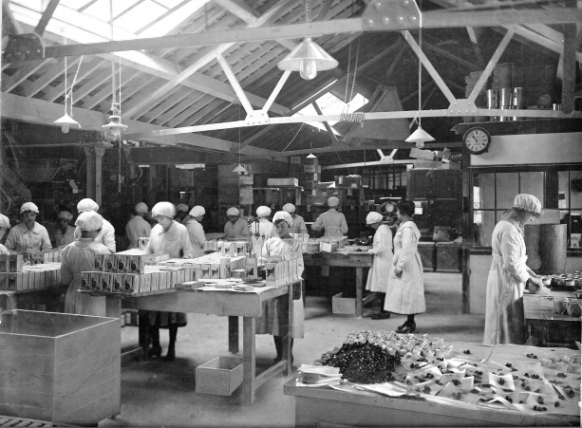 The 1921 photo, taken facing towards the office area, shows the packing floor with a small office and kitchen area on the right, (being the east side of building.). The packing floor still looked the same over 30 years later. The ladies from the packing floor had their tea breaks in there. 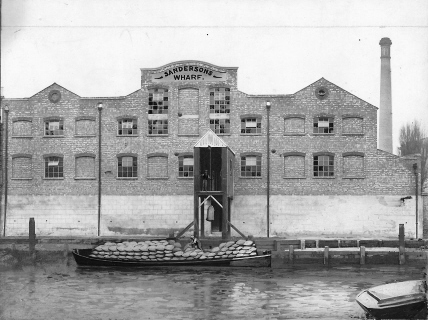 “Sandersons” was Kingham’s own brand, and their products ranged from flour to cake mixes and dried fruits. The packing floor was always kept very busy in the 1950’s when my mother worked there. I recall Mrs May HADLEY was the charge hand. Mr “Dickie” BIRD was responsible for mixing the ingredients, which he did from a small area above the packing floor. I believe he was the only person who knew the secret recipes for the mixes. The gantry & Wharf was used to unload barges directly into the warehouse. It became obsolete with the decline of the river barge trade. The main entrance, to the left of the loading bank had a reception office on the right and the Buyer; Mr HARVEY, had his office off that. Mr Harvey’s office also had the telephone switchboard, which was a 10 x 50 PBX board, (Ten lines, and 50 extensions) where the telephonist sat all day taking calls and plugging them through to the various departments. To the left of the front door was a small locked room where the cigarettes were stored. The rest of the ground floor was the warehouse and loading bank. To the west of the yard was the Cheese dept and Bacon dept, both commonly referred to as the “cheese hole” and “bacon hole.” There were several smoke rooms which would be kept going almost constantly to keep up with the orders for hams, bacon etc. On rare occasions they caught fire. The credit dept was also in this area, where items returned for credit would be unloaded and recorded. The building which fronted Kew Bridge Road was also another part of the warehouse, but a section immediately next to The Lodge where we lived, had been partitioned off and was used as the mechanics workshop for repairs to the vans. In earlier days I think it may have housed the horses. The premises were entered through two large gates beside “The Lodge.” The loading and unloading of vehicles was all done by hand onto sack barrows, although I do recall there was a small portable conveyor belt. Cases were stacked and unstacked by hand in the warehouse, most stacks being over two metres high. We moved into “The Lodge” in December 1957. There had always been a lodge keeper who was responsible for locking and unlocking the premises. The position was only available to an employee of Kinghams, and was a tithe property. If you left Kingham’s you had to leave the house. No rent was paid, as it was considered that the locking and unlocking of the premises was in lieu of any rent. However electricity and gas etc had to be paid. I recall previous lodge keepers as Mr & Mrs MORIARTY, and then Mr & Mrs PASSEY, who were the tenants before we moved in. The Lodge had three bedrooms, living room, large kitchen, bathroom and separate toilet, with a small fenced area which backed onto the yard. The Lodge was situated immediately to the west of the yard entrance which had two large wooden gates. Beside the front door was the separate gate keeper’s office used by “Benny” the gate keeper, who was employed to check the vehicles in and out during the day. We had a small safe under the stairs, and if any of the vans came back after the business had closed it would be used for any money, cheques etc the drivers had collected on their rounds. We also had a phone in “The Lodge.” After business hours the switchboard operator would plug the line to our extension for emergencies. I was given strict instructions by my parents that I was never to use it without permission, and only incoming calls were permitted. Any calls that were made were written in a book by my parents and the money for the call, at public call box rates, was always paid. Although in the early 1950’s Kingham’s still opened on Saturday mornings, by the time I was living there it was a five day week. The warehouse opened at 8am, and the offices at 8. 30 am. Everyone finished at 5. 30 pm. The lunch hour was between 12. 30 pm & 1.30 pm, and there was a ten minute tea break in the morning and afternoon. Everyone including office staff had to clock in and out and no one could leave before the buzzer went at 5. 30 pm regardless of whether the work was finished or not. The clocking-in machine we had in The House was very old and a museum piece even in 1960. It had a large round dial with numbers on it, with a clock face in the middle. Each morning you punched your number with the central arm. It recorded the time on a paper roll inside which was taken out every week and sent to the pay office. If you were more than two minutes late too often, 15 minutes pay was deducted from your wages, and an explanation was required by the managing directors wife, Mrs Abbatt. I have no idea of anyone else’s wage, but I earned 3 pounds per week when I first started as a junior ledger clerk aged 15 in April 1959. The following year I was given a ten shilling rise. This was below other wages at the time though. When I left school I went along to The Youth Employment Bureau which was housed in the old Clinic in Brentford High Street, and I was given a choice of three junior clerk positions. I remember the other two paid 5 pounds per week, but as I lived at Kinghams, I felt it was far more convenient to work there and not have to travel on buses in the rush hour than have the extra money. When I questioned the lower wage I was told that as employees in the food trade we had a duty to provide food at a reasonable price. If we were to ask for higher wages, then the price of food would have to increase and we couldn’t expect people to pay more to eat. I doubt the supermarket chains of today would consider that as a valid argument for lower prices. However it was accepted that we served the community, and paid the price for it, and I was quite happy with that explanation at the time. Business closed at 5. 30pm. and after everyone had left my father locked up. He had a large bunch of keys and each evening I would accompany him on his rounds of the warehouse & offices, making sure everything was locked and heaters, lights etc turned off. In winter we always walked round in the dark with just a torch, and we’d tell each other ghost stories. There was one story of an employee who had died and his body had been found in the warehouse and it was said his ghost still haunted the place. Many times we turned out the torch and stood in the dark, but apart from the usual creak of the stacks we never saw or heard any ghost. However we did have a dog at the time who would accompany us on the evening ritual occasionally but he would never go past a certain point in the warehouse. He would stop, growl, and the fur on the back of his neck would rise. Then he’d beat a hasty retreat back to the door to get out. I was given this information by an older employee. During WW2 every employee had to take a turn at Fire Watch and remain on the premises overnight. I think at least two were on duty every night. I was told they played cards etc to pass the time. However, they did have to contend with the constant bombing. There was an above ground air raid shelter erected in the garden. It was round, and I believe concrete. A bomb landed close to it, and destroyed it completely, killing the occupants. Shrapnel from the explosion also left a large hole in the Iron RSJ girder that spans the entrance door to the main building, right of the bay window. The hole remained and was never repaired. The concrete shelter base remained in the garden, beside the pathway from the house to the yard. When we lived there and looked after the garden we built a low brick wall around the edge of it, sealed it, and turned it into an above ground fish pond. Whilst I have no idea how they dealt with rationing which lasted until about 1953, I do know every staff member was entitled to a staff order and every Friday my father came home with a large cardboard box containing our weekly order which was purchased at wholesale price. In the late 1950’s Kingham’s joined the Federal Grocers Alliance, and the delivery vans which were painted dull yellow and tan and advertised “Sandersons” Products on the sides were repainted green with the round white Federal Grocer Alliance Emblem with a tree in the middle. Larger customers joined this alliance and received more competitive prices as by now the supermarkets were taking a lot of business from the small individual grocer and corner store. Smaller wholesalers were beginning to close and Kinghams took over the business of Golding Brothers, a small wholesale grocer’s in Southall. The sales ledger office had six clerks. Head clerk was Mr BAGG. Then Mrs Lillian LILLEY; Miss Margaret ROSE; Mr Roger MULLEY; Gordon, and myself the office junior. The only machine we had was a very large old-fashioned electric adding machine. It was only used by the junior to check the totals of each invoice against the amount written in the ledger by the clerks. Any error could then be found if the totals didn’t match. A pile of invoices were bought to us each day and they had to be sorted into ledger order, then alphabetical order. If the sales rep (traveller) had forgotten to put his ledger letter A, B, C etc, on the invoice, then you had to know which ledger it belonged to. Eventually I could tell which ledger every customer’s name belonged in. When a new junior was taken on a year or so later I was then a ledger clerk responsible for entering the invoice amounts into the ledger and making out statements for the sales reps to take to the customers. Everything was added up mentally, so the office was always silent. Even a cough could result in a disapproving glare. It was also the junior’s job to make our morning and afternoon tea and even when I was no longer the junior I refused to stop doing it. I wasn’t really keen on office work, and I loved getting out of the office for a few minutes to make the tea in the tiny kitchen at the end of the hallway upstairs. I also had to make tea for Mr Bowes and Mr Filmer. There were at least a dozen travellers who each had a round in a defined district. Each Friday a “travellers meeting” would be held in the sales office after working hours to discuss the special offers and discounts for the coming week. Every traveller was expected to attend. They each used their own cars, so I assume there was an allowance made for the expenses involved. Every year, until the mid 1950’s, Kingham’s organised a day’s outing to the seaside, and several coaches were hired for the staff. I was privileged to be the only child allowed to go on these trips. I don’t know why, but I do recall we would stop on the way home at the half-way houses, where I sometimes played the piano for the sing songs which continued in the coach until we were all dropped off, usually as near to our homes as possible. (See three photos provided by Carole taken at an outing in the early 1950s). During the 1940’s there was “Sandersons Social Society.” Employees paid a subscription to belong to it, and were given a paper receipt. I have no idea what the purpose was, but will investigate further. During the time we lived there, there were only two or three burglaries. Usually they gained entry by breaking the back window in the Managing Director’s office which faced the Thames. I daresay they entered via the tow path and over the back garden wall. Very little in the way of money was ever kept on the premises though and the cigarette store was probably the main attraction. Living in The Lodge we were never aware of any burglaries until my father opened up in the morning. He would then phone the police and Mr Abbatt, the managing director. From as far back as I can remember my father Cyril Henry SHARP worked at Joseph Kingham’s as a “goods-in checker” on the loading bank. My mother Thursa Sharp (nee BARRETT) also worked on the packing floor for a while too, and on occasions I was taken there when I was a child, so I knew several of the staff from a very young age. Kingham’s was considered a family business and although there were over 100 employees at one time, everyone more or less knew everyone else. It was not unusual to hear that a couple who had met whilst working at Kinghams were getting married. I occasionally went on one of the rounds with a van driver, although this was not really allowed owing to insurance purposes. But I thoroughly enjoyed sitting in the draughty noisy vans and watching them unload at the shops. I also spent time in the mechanics workshop which was next to The Lodge, where often the mechanic; Charlie Hodkinson, would be working after hours. In winter a 44 gallon drum with a coal fire in it would be lit, and after work several of the drivers would gather around it drinking mugs of tea. No one seemed in a hurry to leave, and often the conversations would continue after working hours. By the early 1960’s business was declining as larger supermarket chains were becoming popular. Eventually Kingham’s amalgamated with the Teetgen Tea Co of London, and Kingham’s closed after trading in Brentford for over 80 years. We continued to live there until the premises were sold at auction for, I believe, 57,000 pounds. It was bought by developers, demolished, and Kew Bridge House now stands on the site. 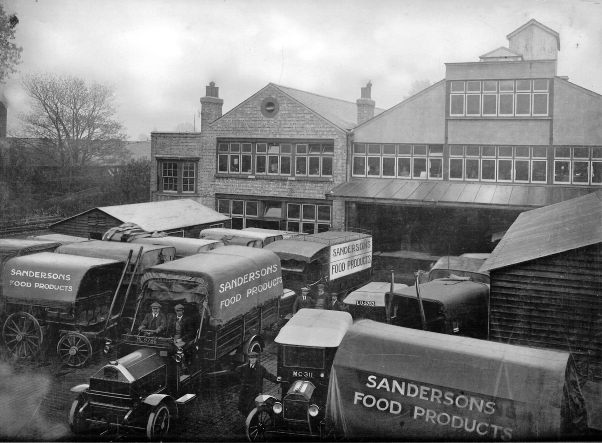 The photos taken in 1921, of the Wharf, and Road transport and Despatch Dept, appear to have been altered to show Sandersons Food Products, and not the name J. Kingham. However closer inspection with a magnifying glass shows a small portion of the name Kingham on two of the horse-drawn covered wagons. On the back of each photo the photographer, Messrs Wakefield of Chiswick & Brentford, gives the order number, and client name as “Sandersons” not Joseph Kingham. Also on the back is a hand-written note.“A large fleet of lorries and vans distributes Sandersons Food products to the home counties.” Perhaps the photos were taken for some sort of article or advertisement in a local newspaper? Van drivers: B Ilbury, Mr Connor, A O’Dell, F Lidiard, A Bushell, J Lawrence, C Hurran, T Lewis, T Hunter, H Hunter, Mr Vinton.